The name Ajalta comes back to the roman period referring to the present Piazza Gamurrini. It comes probably from a top area, fortified raising zone. It appears in very ancient documents such as one of the IX century about a gift by the bishop of Arezzo in the name of Carlo il Calvo, consisting of a “ficus” called Ajalta. The Pieve dates back to the VI century, when the worship of the holy martyr Savino spreads from Spoleto to the North. Originally it was in Barbaiano, where now there is the municipal graveyard, but in 1175 it was moved between the top ground of Ajalta and the urban area of Piazza di Monte. The archives of 1222 acquaint that in that period Monte San Savino was ruled as a Republic governed by a senator, chief of four consuls, one for each quarter. Supporting the Guelph party, Monte San Savino was under the aims of the Ghibelline Ubertinis of Arezzo. After receiving the political exiled Aretini Guelphs headed Fumo Bostoli allied with Siena and Florence, Monte San Savino took part at the “Giostre del Toppo” against Arezzo, mentioned by Dante (Inferno XIII, 121). After the battle of Campaldino (1298) where Florence defeated Arezzo, Monte san Savino became a real Florentine Guelph bulwark in Valdichiana. But later Uguccione della Faggiuola, podestà of Arezzo, conquered the castles that Arezzo had lost in Valdichiana, so that Monte San Savino passed under the power of Arezzo. 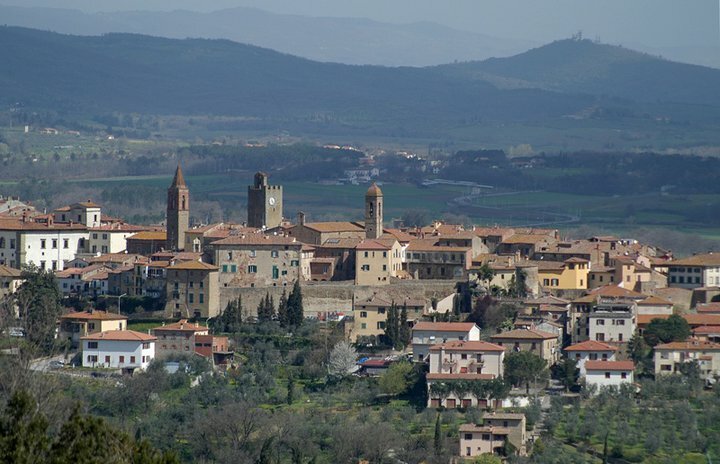 In 1306 the Guelphs sheltered in Monte San Savino “given itself heart and soul to the Florentine Republic” (Guelfi, Baldi), because Tarlati obliged them to leave Arezzo once more. Soon Tarlati punished Monte San Savino (1325) “the bishop and his men rose, he took all the inhabitants out of the castle and burned and destroyed the land” (Villani). The inhabitants were obliged to shelter on Le Vertighe hill until 1337. Perhaps the rebuilding of the urban center with his typical Medieval “spin shape” comes back to this period. Later Monte San Savino passed under the control of Perugia spreading in Valdichiana thanks to an alliance with Florence. In 1339, after an agreement between Perugia and Florence, Monte San Savino passed under the control of Perugia stably until 1380. During the following 4 years the town passed before under Arezzo (Carlo di Durazzo), later under Siena, finally under Florence(1384), whose influence will last for the following centuries. With the subjection to Florence a podesteria containing Alberoro, Gargonza, Palazzuolo and a vicariate (that in 1388 moved to Lucignano)were established. In the XV century Monte San Savino enjoyed a relative quiet, so the family Ciocchi began his climb. After a plot against the Medici (1478), the enemies moving to Florence besieged Monte San Savino that capitulated against the League consisting of the Church, Siena and the king of the Two Sicilias until 1481, when it came back under Florence. In 1469 the Florentine Republic let the community have a free fair called later “Big Fair” whose tradition lasts until nowadays. In XVI century the family Ciocchi di Monte reached his highest splendor especially by Antonio, cardinal and patron of the arts of the Savinese Andrea Sansovino. Antonio tried to guarantee the protection of the Medici until 1550, when his nephew Giovanni Maria di Monte became Pope with the name of Giulio III. Thanks to this, Monte San Savino became an earldom under the control of Balduino di Monte, the Pope’s brother. In 1569 the di Montes extinguished and the town came directly under Florence. The following year the important Vicariate of Valdichiana was established containing Monte San Savino, Lucignano, Foiano. In the Renaissance, very excellent artists flourished in Monte San Savino such as Andrea Sansovino, Niccolò Soggi (Perugino school), Stefano Veltroni, Orazio Porta (Vasari’s school), Ulisse Giocchi, the sculptor Accursio Baldi. From 1604 to 1640 Monte San Savino was under a new enfeoffment by the Marquises Orsini. 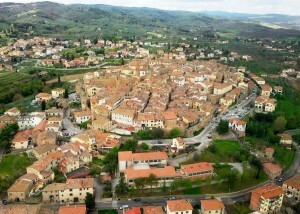 Later the town will become Mattias de Medici’s personal fief (Grand Duke Ferdinando II’s brother). In 1667, Ferdinando II’s wife, the Duchess Vittoria della Rovere, became Princess. After her death a separate administration was established with a commissar elected by the Grand Duke. Monte san Savino maintained some privileges until 1748, when it passed under the direct control. 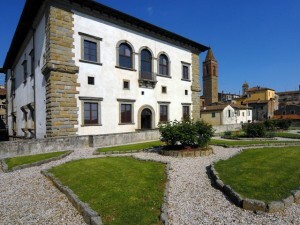 In July 1799 the Jewish community of Monte San Savino, who settled in 1627 with the family Passigli, was expelled by the “Viva Maria” movement in Arezzo. With the end of the Napoleonic regime, the new community was re-introduced. During the Risorgimento a lot of young Savinesi were working for the unity of Italy laid down in 1861. 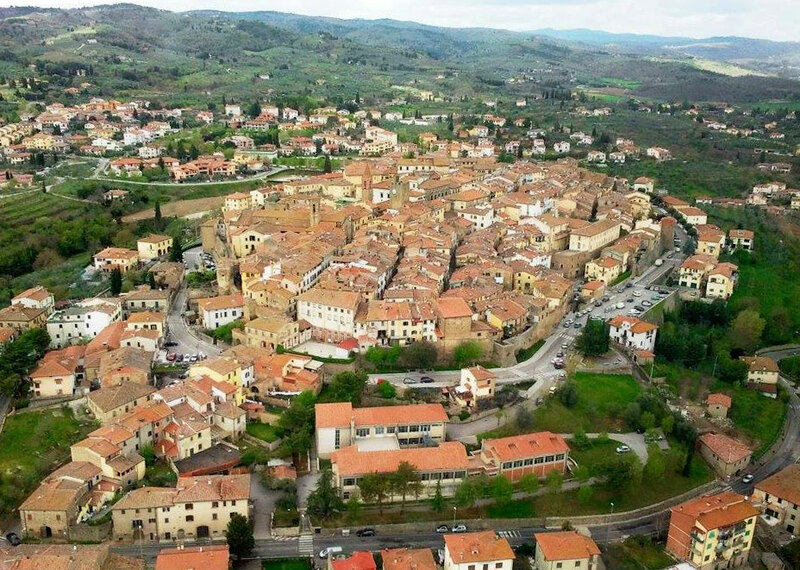 A year before the majority of the inhabitants of the town was in favor of the annexation of Tuscany to Piemonte. During the XIX century a better economical stability favored a demographic growth and a higher standard of life until the First World War. 178 Savinesi died in the war and are remembered on the monument in Piazza della Riconoscenza and in the memorial plaques in the Chiesa del Crocefisso. At the beginning of the Fascism Giuseppe Civitelli died victim of the Fascists (1921). In 1924 the Town Council conferred the honorary citizenship unanimously by the proposal of the secretary of the local Fascio. In the Second World War Monte San Savino remembers the death of about 70 citizens, among them 11 victims of German reprisals (two of them were women). At the fall of Fascism a local Committee was instituted (CLN), while the ton was victim of the retreating German troops. Bruno Tiezzi was the first major after the Resistenza , while at the institutional referendum on 1946 June 2nd 3231 were the votes for the Republic whereas 1758 were for Monarchy.